This valentine add Love Stickers into Whatsapp! “Love Stickers for Whatsapp” are a great way to wish your love one. This is awesome way to say ‘I Love You’. 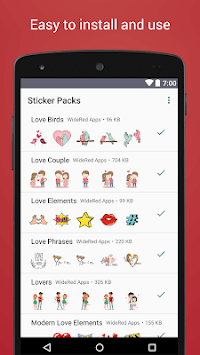 This “Love Stickers for Whatsapp” free Stickers pack app specially created for Lovers. 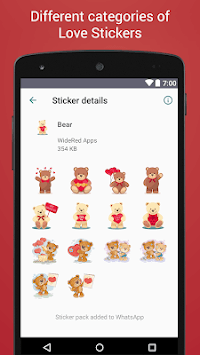 You just have to add different category of Stickers Packs from given list. Love is really special feeling for everyone. Love Stickers make it more convenient to express your love. Send Love Hearts using this stickers app! Numerous “Love elements” are specially designed to beautify your chats and create awesome romantic time! 01. 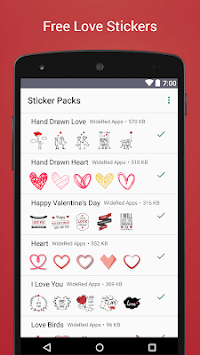 Lot's of Love Stickers Packs for Whatsapp. 02. Add packs into Whatsapp by just clicking on + sign from list. 03. Detailed screen of stickers.